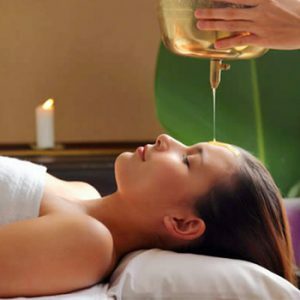 Shirodhara is an ancient Ayurvedic therapy.The term shirodhara is a union of two words: ‘shiro‘ meaning head and ‘dhara‘ meaning pouring in a stream. This is the most divine ancient Ayurvedic ritual. It deeply relaxes mind and body, and improves the mental clarity and comprehension. Warm oil (or other liquids) pours in a continuous stream over the forehead or ‘ajna marma’, an area where nerves are highly concentrated. The pressure of the oil onto the forehead creates a vibration. The oil saturates the forehead and scalp and penetrates into the nervous system. The gentle pressure and soothing warmth of the oil allows the body, mind and nervous system to experience a deep state of rest, similar to meditation. It stimulates the pineal gland, or “third-eye”. It helps to reduce and relief migraine headaches and releases negative emotions. It helps to improve sleep patterns. Shirodhara helps in clearing our mental fog and nagging thoughts, and allows the nervous system to calm down. It is very helpful in depression, headaches,high blood pressure, sinusitis, anxiety, allergic rhinitis, premature hair graying, hearing impairment, insomnia, Meniere’s disease, skin problems including psoriasis, tinnitus, neurological disorders and vision problems. Plus it’s also used non-medically for its’ amazing relaxing properties.The action and qualities of the liquid used in shirodhara counters the qualities of the out of balance doshas. It soothes, nourishes and pacifies the doshas through the application of the liquid to the forehead, scalp and nervous system. Shirodhara should NOT be given to women in their third trimester of pregnancy and to those with a rash or sunburn on the forehead or scalp. Other contraindications include brain tumor, recent neck injury, abrasions or cuts on the head, fever/chills, acute illness, nausea, vomiting, severe weakness, exhaustion, fainting or spontaneous sweating.